A warm welcome awaits you at Witches Craig Caravan Park from owner Veda. 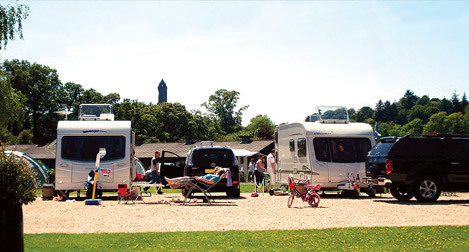 The 2015 AA awarding winning “Scottish Campsite of the Year” is situated at the foot of the Ochil Hills under the watchful gaze of the nearby National Wallace Monument. From the mountains and the lochs of the nearby Trossachs to the river running through the Forth Valley to the estuary at Edinburgh, Witches Craig is surrounded by some of the most breathtaking scenery in Scotland. The National Wallace Monument towers over Witches Craig and Stirling Castle frames the horizon just 3 miles away. You can walk in the footsteps of William Wallace and Robert the Bruce, see where Mary Queen of Scots lived and James VI was crowned, all within easy reach of Witches Craig. Did the Devil visit the rocky outcrop behind the park to dance with a covan of witches? Does a ghost known as the Green Lady walk the ramparts of Stirling Castle? There’s plenty of mysteries to solve at Witches Craig! Friendly personal greeting on arrival made us feel very welcome and relaxed, great after a long and weary journey! Loved our stay and will be visiting Witches Craig again. Well kept site with music in the loos! Safe for kids. Good sized pitches. Beautiful views. Great walking and cycling. Very friendly and helpful owner.